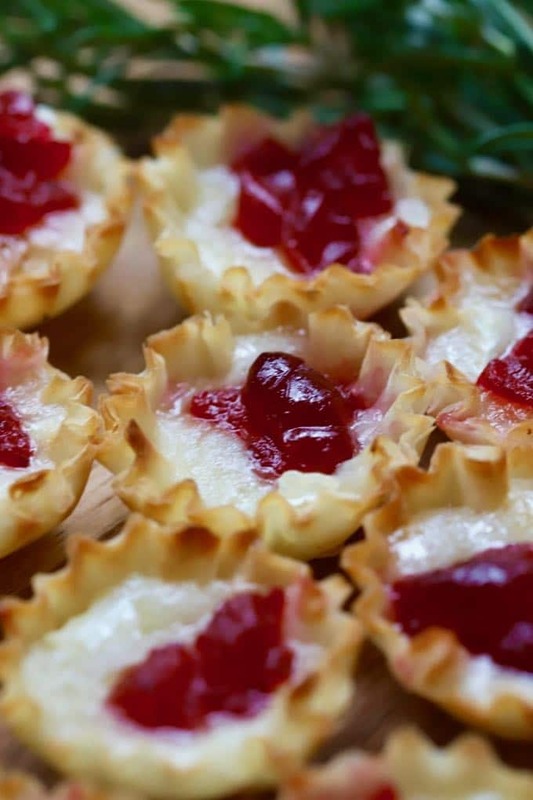 On this first day of December, I am bringing you a very merry and festive cranberry and brie Christmas appetizer recipe. Easy Cranberry Brie Bites, which only has 3 ingredients, will take you less than 15 minutes to prepare. 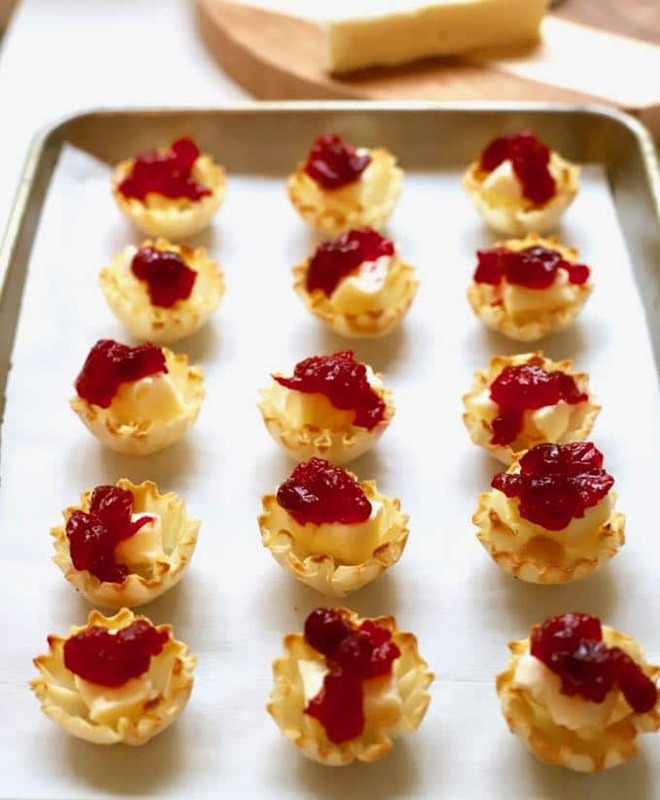 Utilizing leftover tart cranberry sauce from Thanksgiving, a wheel of creamy brie cheese, and light, crispy mini fillo shells, these elegant and delicious cranberry brie appetizers will wow your family and friends and they will never guess how easy they are to make. My best advice, make twice as many of these cranberry brie tartlets as you think you will need because they will go fast! The Christmas season is a magical time of year and instead of a partridge in a pear tree, what better to kick it off than with a new holiday-themed recipe every day for the next 12 days to help with your holiday entertaining. Similar to The 12 Days of Christmas, the famous English Christmas carol, starting today I’ll be posting a new easy Christmas recipe every day for 12 days for The 12 Days of Easy Christmas Recipes! Unlike the song, however, my 12 Days of Easy Christmas Recipes starts on December 1. The official 12 days of Christmas, a Christian tradition, which shares its name with The 12 Days of Christmas carol, marks the period between the birth of Christ on December 25 and the arrival of the three wise men on January 6, the Epiphany. Instead of two turtle doves, look for my Easy Red Velvet Cake Trifle recipe tomorrow; and instead of three French hens, I’ll be posting a decadent Pralines and Cream Ice Cream recipe the day after, which will knock your socks off! If you would like even more Christmas themed recipes, check out these roundups of quick and easy recipes from top bloggers around the country: 25 Best Christmas Breakfast/Brunch Recipes, 25 Best Christmas Dessert Recipes, and 31 Easy Homemade Edible Christmas Gifts. I know you are crazy busy right now, so let’s get right to this simple recipe for Easy Cranberry Brie Bites! 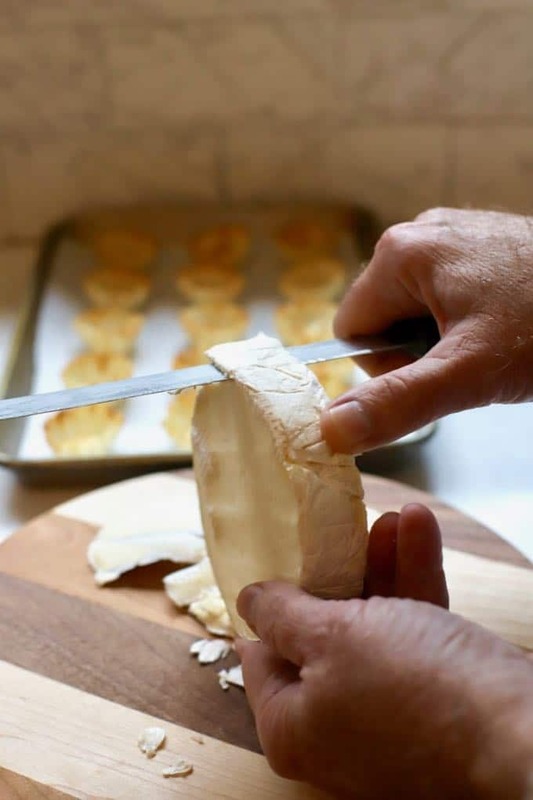 Carefully remove the rind from the brie with a sharp bread knife. 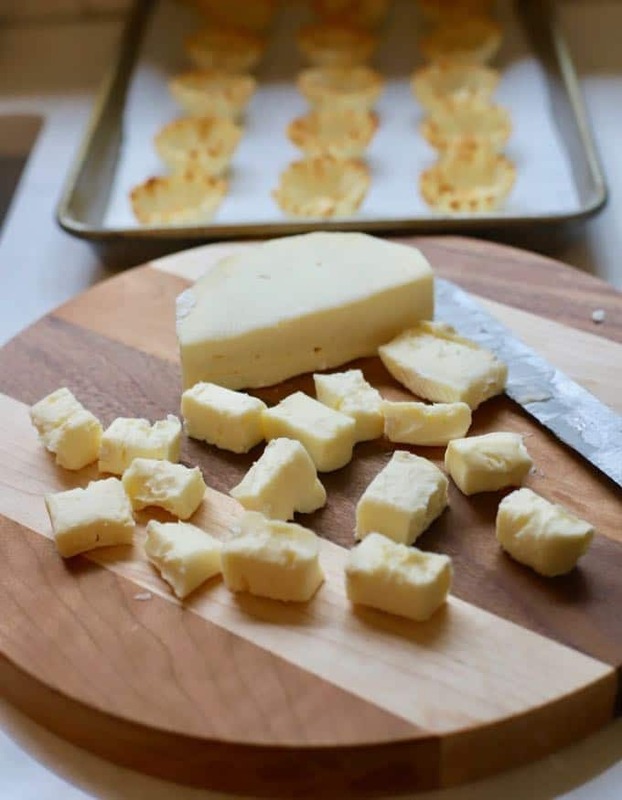 Cut the brie into 1/2 inch squares. To make 3-Ingredient Easy Cranberry Bites ahead, make them according to the directions, but do not bake. Place the filled fillo shells back in the tray they came in and cover tightly with plastic wrap. Place the tray back in the box and freeze for up to 2-3 months. Allow the bites to thaw before baking and bake as directed. Pepper jelly, fig preserves, honey, or your favorite jam or preserves can be substituted for the cranberry sauce. If you don’t have leftover cranberry sauce, you can also use purchased whole berry cranberry sauce, and probably the jelled sauce would work too, but I would only use that in a pinch. You can make a delicious homemade cranberry sauce by combining 1 cup of water, 1 cup of sugar, and a 12 oz bag of fresh cranberries in a saucepan over high heat. Bring to a boil, reduce the heat to medium, and cook for 10 minutes. Cool and store covered in the refrigerator for up to 2 weeks, or in the freezer for 2-3 months. 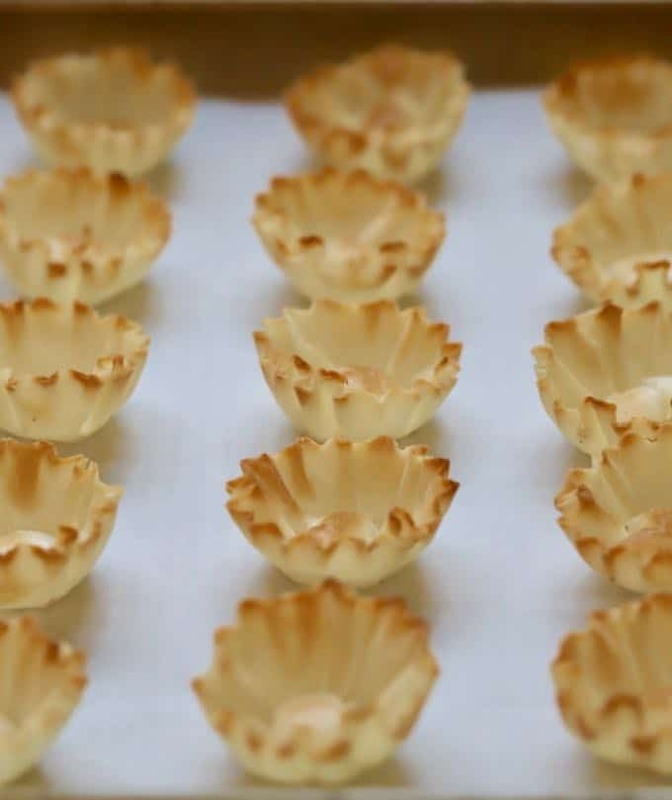 You can also substitute puff pastry for the mini fillo shells. 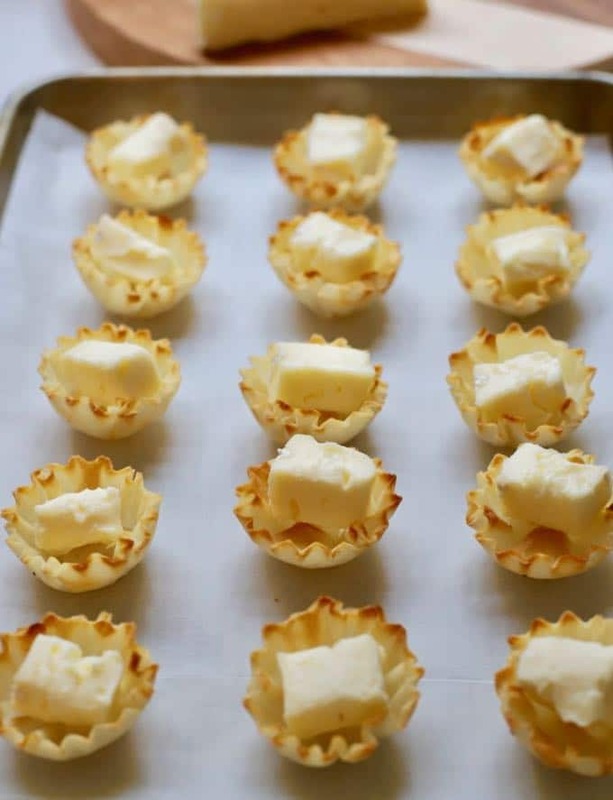 Simply cut the puff pastry into small squares, place into mini muffin cups and follow the rest of the recipe. 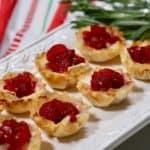 Utilizing leftover tart cranberry sauce from Thanksgiving, a wheel of creamy brie cheese and light, crispy mini fillo shells, these elegant and delicious appetizers will wow your family and friends and they will never guess how easy they are to make. My best advice, make twice as many of these cranberry brie tartlets as you think you will need because they will go fast! Pepper jelly, fig preserves, honey, or your favorite jam or preserves can be substituted for the cranberry sauce. If you don't have leftover cranberry sauce, you can also use purchased whole berry cranberry sauce, and probably the jelled sauce would work too, but I would only use that in a pinch.